Two low pile sides make this perfect for every step in your detailing process. Great towel for coating removal. Autofiber's Mr. Everything Microfiber Towels are great for just about every job. In fact, many professional detailers use this towel for every detailing process, color coded of course. The first time you touch these towels you will understand why! They are so versatile! They can be used successfully for every step in your detailing process. These towels are extremely soft. They use Autofiber's premium polyester and polyamide raw materials spun into a blend of 70/30, 350 gsm, microfiber. They are woven on high-end German knitting machines and chemically split at their world class dye house. 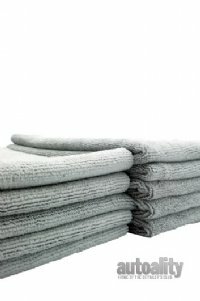 The towels have an Ultrasonic Cut edge with no stitching or silk polyester that can scratch or leave streaks. The Mr. Everything's are the perfect size, 16" x 16" so they can be folded twice to make perfect 8" x 8" square that can be rotated for 8 clean sides. After using your Mr. Everything towels, make sure to launder them properly using Micro Restore Microfiber Detergent.